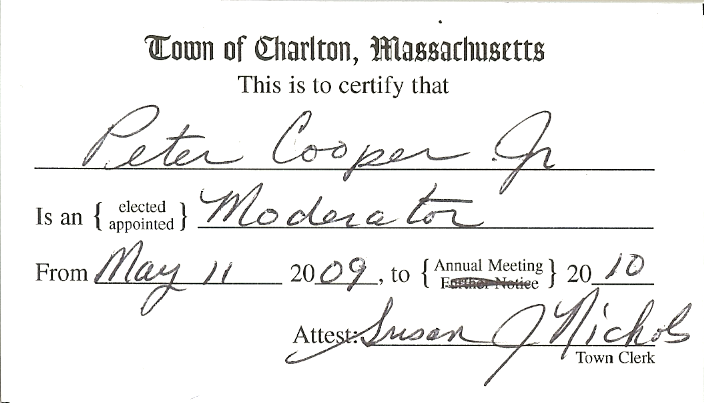 Posted on May 18, 2009 by Peter Cooper Jr.
I’m now done presiding over my first town meeting as Moderator. Overall, it went rather smoothly. There was an odd case that Town Meeting was mad that nobody from the Water/Sewer Commission was there to answer questions, so they didn’t pass the sewer budget at first, but eventually it was motioned to reconsider (once a representative from Water/Sewer was there), and I eventually allowed the reconsideration, which passed. Reconsideration is a tricky thing, as it’s helpful to allow it if a good reason exists to believe that Town Meeting has legitimately changed its mind, but one wants to not let people abuse it to lengthen meetings and try to change things once some people leave and the house is stacked in their side’s favor. In this case, I decided that there wasn’t enough debate and that cooler heads existed at this point in the meeting, and there was good reason to believe that the Town would change its mind, so I allowed it. A lot of people came up to me after the evening and said I did a great job, so I guess I must have been alright. I believe that a video of the meeting will be playing on local cable access eventually. I hope to watch it to see how I looked. If there’s interest, I might be able to make a recording available to others (I think it would fall under Public Domain, but that’s not immediately clear to me). On Saturday, I head-judged Southern New England Magic Regionals, which went rather well. The only big issue was needing to re-pair a round after players had been seated and before they started playing, but things went great for the most part. Plus, we certified a new level-1 judge, which is always exciting. Over the past week, I’ve been talking to, getting phone calls from, and getting emails from people such as the Town Administrator, Town Counsel (Charlton’s lawyer), the Town Clerk, and the chairman of the Finance Committee, all helping me to prepare for moderating Town Meeting tonight. I think I’m pretty prepared, and I’m looking forward to it, but it’s definitely a big step. There’s a lot of unknowns. Everything may get voted on with little debate, or people might get into some very heated discussions about some issues, over which I’ll need to maintain order. It should be an interesting experience, at any rate. Posted on May 15, 2009 by Peter Cooper Jr.
Today, Hannah turns one year old. Posted on May 13, 2009 by Peter Cooper Jr.
As the only person in town who expressed interest to the Selectmen, they tonight unanimously appointed me as the interim Town Moderator. And next week’s Annual Town Meeting sounds like it may have several heated issues. This will be interesting. At last Tuesday’s selectmen’s meeting, they said that they would be taking letters of interest in the position of Town Moderator for the week, and make a decision at a meeting tonight. (At an unusual meeting time and place for them, but I think that its main purpose is to go over the proposed budget with the finance committee.) So, I may get appointed tonight, especially if I’m the only person in town that wants the job. The Annual Town Meeting is next Monday. On Saturday, at a yard sale, I picked up an interesting-looking game, titled “Star Trek: The Next Generation: Interactive VCR Game: A Klingon Challenge”. It’s for 3-6 players, and I get the impression from a quick glance through the rules that it’d work better with closer to 6 than closer to 3. Would people be interested in coming over sometime to try it? We’ll probably be waiting until Star Trek XI comes out on Netflix before watching it. Please be kind and don’t spoil us until we’ve seen it. Hannah turns 1 on Friday. She may end up walking unassisted by then. But if not, I’m sure it’ll be shortly thereafter. Last Monday, we had our first prenatal checkup for our newest Baby, and they took an ultrasound to verify the age. I haven’t gotten around to scanning it in yet, though. And no, we’re not having twins. Posted on May 4, 2009 by Peter Cooper Jr.
I’ve heard from Mr. Singer (the former Town Moderator, recently elected to the Board of Selectmen) that he was told that the Selectmen will be appointing the vacant position of Town Moderator for the remainder of the year. Today’s Southbridge Evening News reports that it’s Mr. Singer himself who appoints his successor, although I’m pretty sure that that’s just another error by the paper. My reading of Town Meeting Time and M.G.L. c. 39 §14 says that the position is appointed “by the voters of the town”, which I think means that it would be selected at the next Town Meeting. I sent an email last night to the office of the Board of Selectmen saying that I was interested, and I just called them to confirm they received it. They said that they had, and that they were checking with Town Counsel (the town’s lawyer) to see what exactly the procedure is. In any event, I’ll be attending the Selectmen’s meeting tomorrow evening (their only meeting before the Town Meeting on May 18) to see the status. Even if they aren’t the appointing authority, it may be good for them to recommend somebody to Town Meeting, and at the very least whomever will be taking the job should be familiar with the warrant and the Selectmen’s expected motions on the articles. Posted on May 2, 2009 by Peter Cooper Jr.
My aunt Donna, who was running unopposed for Cemetery Commission, won with 548 votes. For Selectmen seat #1, incumbent Rick Swensen defeated 18-year-old challenger Joe Szafarowicz 458-286. For Selectmen seat #2, challenger David Singer defeated incumbent Jack Bacon 412-343. The question to change the position of Town Clerk from an elected to an appointed position was defeated, 308-374. Mr. Singer, who just won a selectmen’s seat, was the Town Moderator. The Selectmen may be appointing a successor to moderate town meetings until the next election. I’m thinking I’ll be writing them a letter this weekend asking to be appointed. I’ll also be re-reading Town Meeting Time: A Handbook of Parliamentary Law.